The unbeaten run (in the league) ends not with a roar, but with a whimper. In what was a reasonably entertaining game of football, the Sky Blues came up short against a Burton side that near-monopolised possession. A sloppy set-piece own goal proved to be the difference between the two sides, with Mark Robins unable to inspire his side to find a way back into the game. So often in football, the analysis of the game is defined by the result. Teams don’t just win, they obliterate the opposition, teams don’t just lose, they are a complete shambles. It’s often the case, as was on show in this game, that relatively narrow margins decide contests, this time the Sky Blues were on the wrong end of those margins. It would be hard to argue that Burton were not the better of the two sides. They controlled large portions of the game, and got players into dangerous positions by working overloads both through the middle of the pitch and in wide areas. However, the Sky Blues were not without a threat of their own, with Tom Bayliss and Luke Thomas in particularly dynamic form during this game. 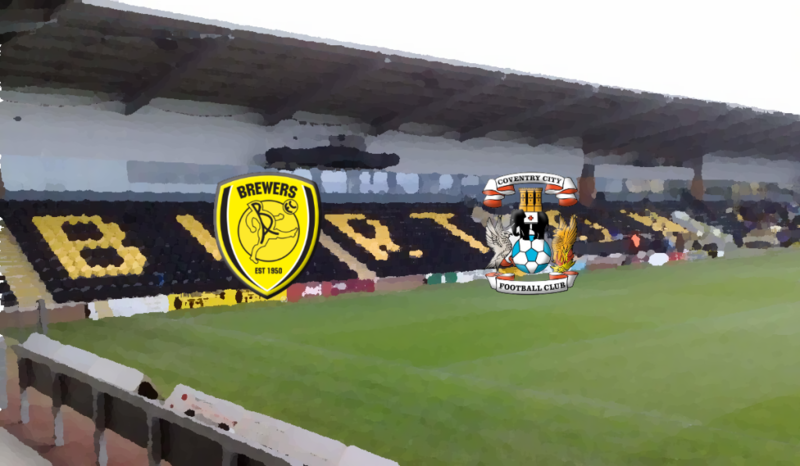 While the decision-making in our attacking play can be questioned, what cannot be is that we caused Burton constant problems on the counter-attack when the game was at 0-0. It wouldn’t have been against the run of play had we scored a goal, even two, before Burton eventually took the lead. This was far from a terrible performance. After such a positive run, it’s frustrating to lose – especially as it is now, taking the cup competition into account, our third in a row. We went six games unbeaten producing a similar-ish levels of performance to this showing against Burton, things conspired in our favour during those games, they didn’t in this one. Let’s not throw everything out in reaction to this, let’s dust ourselves off and attempt to put together another run. While it wasn’t a terrible performance overall, the inability to threaten Burton’s goal in a meaningful manner after falling behind was the worst aspect on display. Burton’s extra man in midfield made it difficult for us to play through the centre of the park, moreover, the team was set-up to play counter-attacking football and couldn’t get out of that made when the onus was put to us to be more proactive in influencing the game. The best teams step up through the gears when they fall behind, on this showing, we stalled and sputtered. Mark Robins’ substitutions made little impact on the proceedings, more from a lack of decisive quality on the bench than poor tactical decisions. Michael Doyle was over-worked in the centre of the pitch and had to be taken off, summing up just how things weren’t working for us in this game. If we want to take the next step as a team, we’ll need to be able to take a hold of games for sustained periods, both in terms of possession and attacking threat. It was notable how Tom Bayliss and Luke Thomas’ influence on the game faded over the course of the 90 minutes, this wasn’t just down to tiredness, they just weren’t able to get on the ball enough. It may take longer than the end of the season to become the kind of side that controls and wins games consistently. Right now, we’re a counter-attacking side that more-or-less needs to score the first goal in a game to be confident of winning. This may work enough for a reasonably good league finish this season, but we have to aspire for something more over the longer-term.